On the day we flew in from Oahu, Kauai turned moody. Blue skies gave way to looming rain clouds. The skies darkened, the greens muted, and wind came at full blast as we drove through the narrow single-lane Route 56 to the north side of the island. With lush remnants of rainforest surrounding every place you visit, Kauai was an entirely different type of beauty. Mother Nature reminds you of her omnipresence as we found ourselves stopped by rain, flooding, and erosion at major tourist attractions. A tropical wonder, it was awe-inspiring and humbling. We checked into our Princeville Airbnb, and spent the afternoon reading before ordering in takeout pizza. Luckily, day two greeted us with sunnier skies as we found ourselves at a ranch. Our first time on horseback, my sister and I channeled that horse girl energy and followed the guide through hidden trails on the ranch property. We admired Kauai’s scenic interior as we meandered through nature, finally stopping at a small waterfall for lunch and a quick swim. We learned about local Kauai small-town life, local food, and the floods that devastated the island just months prior. Our last day was a hodgepodge of sights and tastes. We explored grocery stores and farmers markets, buying the interesting food we don’t normally find on the mainland: taro bread, hazelnut milk, giant wild gold grapefruits, lilikoi pie, coconut soft drinks, and taro desserts. We also roadtripped to the west side of the island, where we drove past funky small towns and a road that reminded me a lot of SLO before continuing up to Waimea Canyon. The flora and fauna reminded me of the scenery I’d grown up with - the hues of the American Southwest, a dry climate, dusty rugged desert, and a faint blanket of fog enveloping the view before us. Nonetheless we took advantage of the striking red rocks that lie underneath the fields of gold for a country-album-debut photoshoot? It’s a mood. Last but not least, this section is dedicated to the feral chickens of Kauai, the most fearless creatures I’ve met. If anything, these chickens remind you to slow down your pace and smell the roses as you wait for them to cross the street. It’s not everyday you get to witness restaurant hosts chase chickens away from their balcony seating area, threatening to add them to the menu. 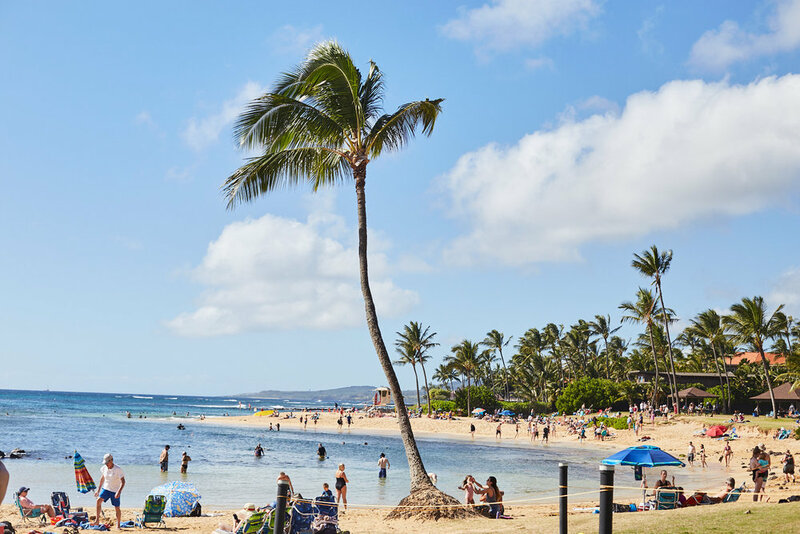 Although American, the people and the land of Hawaii are so different from my understanding of “American.“ The island life, full of wild roaming chickens and trees that serve as bathrooms, offer a retreat from urban conveniences and the hustle and bustle of city life. People are nice and vegetation is diverse. I loved being able to relax and breathe in Kauai instead of rushing from one destination to the next, allowing the weather to determine our plans for the day. Leaving with a curious admiration, I hope to hike and explore more of what Kauai has to offer next time I visit.